It’s the Ford Big Tire Event at the Uftring Automall in East Peoria! 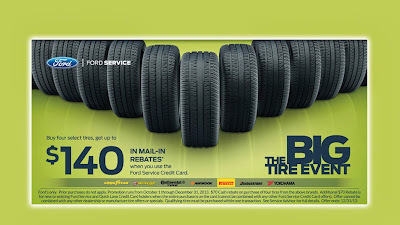 For a limited time only, purchase four select tires and receive up to $140 in mail-in rebates when you use the Ford service credit card. Offer valid for Goodyear, Dunlop, Continental Tire, Hankook, Pirelli, Bridgestone and Yokohama tire brands only. Get your tires checked before the winter weather hits! Now is the perfect time to service your car before any winter weather is in our local forecast. Don’t miss your chance for a great deal on brand new tires from the Uftring Automall, the deal ends on December 31, 2013. Hurry! Ford Big Tire Event Disclaimer: $70 tire rebate. Dealer-installed retail purchases only. Limit one redemption per customer. $70 credit card rebate. Subject to credit approval. Complete purchase must be made on the Ford Service Credit Card. Offer valid until 12-31-13. Submit rebate by 1-31-14. $70 tire rebate by check or apply to an active Owner Advantage Rewards account. $70 credit card rebate by check only. Cannot be combined with any other tire manufacturer-sponsored or Ford Service Credit Card rebate/offer. See store for vehicle applications, rebate and account details.